New Delhi July 12 (IANS) When the lens briefly replaced the brushes for Indian Picasso M. F. Husain what took birth on the streets of Chennai in the 1980s was a rare series of photographs called the "Culture of the Streets". Cited as a collector s item 20 individually signed photographs are on exhibition at the Art Heritage Gallery here. 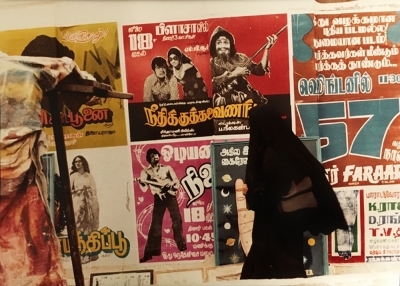 In the photographic series the Indian modern master (1915-2011) features India s popular culture through cinema hoardings on the roads of Chennai. "Along with graffiti on the street walls Husain recognizes this as the authentic intense visual culture that has developed in our teeming urban metropolis " the Gallery said. His use of silver foil photo paper is an example of the artist s experiments with unorthodox materials and techniques it added. Having worked as a billboard painter in his initial days his association with the streets of India goes back a long way. Primarily known as a painter Husain s experimentation with the camera came at a time when the burgeoning film industry was all too visible in the popular culture in India. "Culture of the Streets" is part of a group exhibition at the gallery which has photographs by photographer Cop Shiva along with paintings drawings and sculptures by noted artists like Gouri Vemula Zai Jharotia Sunanda Khajuria Rajesh Deb Arun Pandit and G. Reghu. The show is open for viewing till August 6.